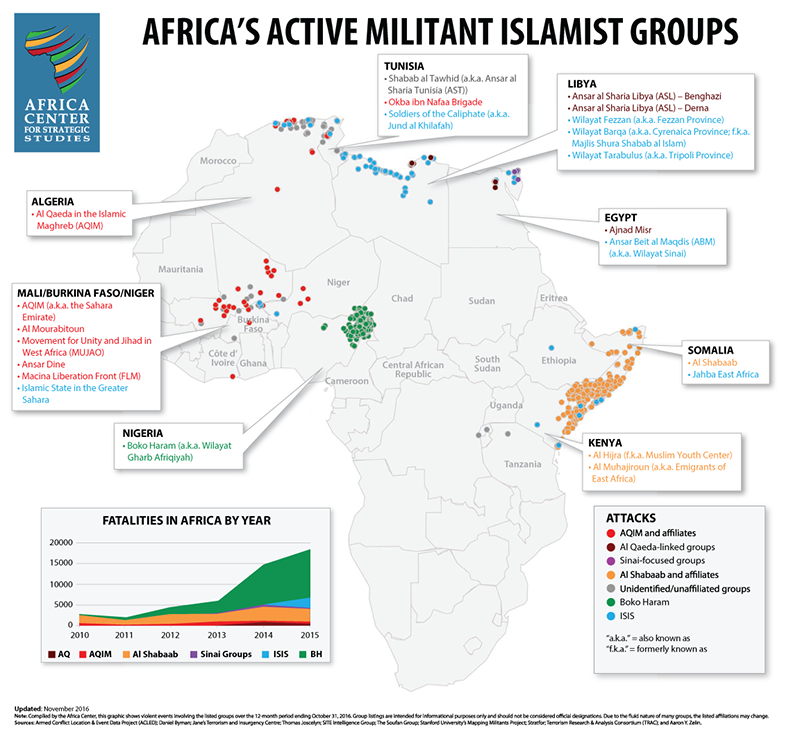 ISIS is not well-rooted in the communities where Africa’s most active militant Islamist groups operate. Its closest ties are in Tunisia (the largest source of foreign fighters in Iraq and Syria) and Egypt (via Ansar Beit al Maqdis), plus a cadre of fighters displaced from Sirte and the Sahel. ISIS’s continued loss of territory and operational capacity in Iraq and Syria may lead to an increase in its fighters returning to regions in Africa already facing a threat from violent Islamists. But without funding and technical support, these militants are more likely to simply melt into the complex matrix of militant Islamist groups already active in these regions rather than create an expanded ISIS presence. Boko Haram and al Shabaab—the most lethal militant Islamist groups in Africa—predate ISIS, are well integrated in their communities, and do not need ISIS for resources or operational support. The threats these groups pose, therefore, is likely to be unaffected by what happens to ISIS in Syria and Iraq. Joseph Siegle, “ISIS in Africa: Implications from Syria and Iraq,” SMA Reachback, March 2017.